Between the Boston Massacre in 1770 and the Boston Tea Party in 1773 a period historians refer to as the lull a group of prominent Rhode Islanders rowed out to His Majesty s schooner Gaspee,which had run aground six miles south of Providence while on an anti-smuggling patrol. After threatening and shooting its commanding officer, the raiders looted the vessel and burned it to the waterline. Despite colony-wide sympathy for the June 1772 raid, neither the government in Providence nor authorities in London could let this pass without a response. As a result, a Royal Commission of Inquiry headed by Rhode Island governor Joseph Wanton zealously investigated the incident. 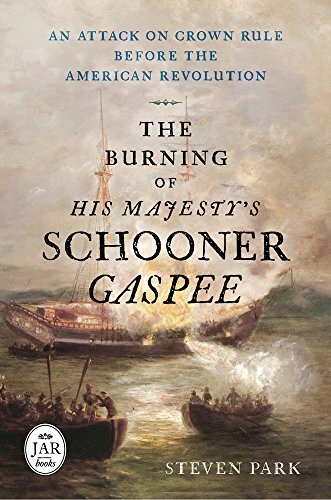 In The Burning of His Majesty s Schooner Gaspee: An Attack on Crown Rule Before the American Revolution, historian Steven Park reveals that what started out as a customs battle over the seizure of a prominent citizen s rum was soon transformed into the spark that re-ignited Patriot fervor. The significance of the raid was underscored by a fiery Thanksgiving Day sermon given by a little-known Baptist minister in Boston. His inflammatory message was reprinted in several colonies and was one of the most successful pamphlets of the pre-Independence period. The commission turned out to be essentially a sham and made the administration in London look weak and ineffective. In the wake of the Gaspee affair, Committees of Correspondence soon formed in all but one of the original thirteen colonies, and later East India Company tea would be defiantly dumped into Boston Harbor. STEVEN PARK is the director of Academic Services at the University of Connecticut s maritime campus where he teaches maritime studies. He received his PhD in history from the University of Connecticut, and his articles have appeared in a number of publications, including International Maritime History, American Neptune, Journal of the American Revolution, and Connecticut History Review.